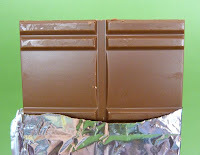 Today was Day #7 of Milk Chocolate Theme Week. Milk Chocolate bars are, by definition, at the lower end of the cacao percentage range -- meaning that these bars have more sugar and milk than my usual dark chocolate fare. While I had a tough time tasting the cacao beyond the wall of sweet sugar, my daughter helped with today's tasting, and she picked up some "spicy" notes. The texture was smooth. 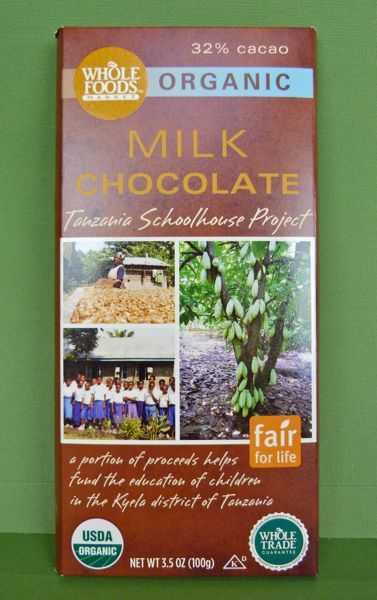 A portion of the proceeds from sales of this Organic, single origin 32% cacao (Tanzania) Milk Chocolate bar -- from Whole Foods Market (Austin, TX) -- will, according to the label, go to schoolchildren as part of a Tanzania Schoolhouse Project. Thank you for highlighting the Whole Foods Market Tanzania Schoolhouse Bar, which is made in milk and dark chocolate. This year so far Whole Foods has donated $16,000 to Tanzania School Fund. Currently two classrooms are being built and some of the proceeds are going to the school book program for primary schools.